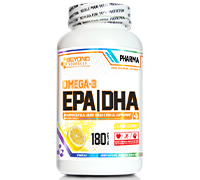 Beyond Yourself’s EPA|DHA is a GMO Free, pharmaceutical grade product derived from non-threatened species of wild-caught anchovy, sardine and mackerel. There is strong scientific evidence from human trials that omega-3 fatty acids from fish oil supplements (EPA + DHA) play an important role in maintaining overall good health and fitness levels. Fish oils speed up recovery time, burn body fat, reduce joint pain/inflammation and promote muscle growth. Fish oil supplements also enhance mood, reduce the risk of heart attacks, lower blood pressure, and can help prevent strokes. Our unique formula has little or no repeat and is GMP certified + exceeds Canadian standards for freshness and purity. Every batch has been tested and is guaranteed to be free from contaminants including heavy metals, PCBs and dioxins. 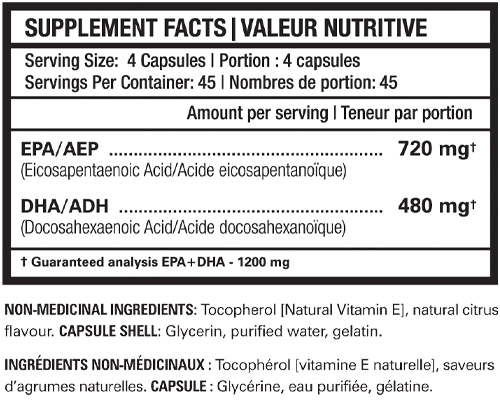 Take 4 capsules daily with meals or as directed by a health care practitioner.